« Have you ever used this amazing persuasion tactic? These are only a few of the almost endless branding possibilities. The manner in which you answer this question will determine so many other things in your marketing — your ads, your website, your tagline (if you have one), your philosophy, etc. Come up with a brand identity that you’re comfortable with and adhere to it consistently throughout all your marketing. 2. What is your positioning? Among the law firms with whom you compete, how are you perceived in terms of your position on the totem pole? How would you like to be perceived? The easiest way to explain this to you is by looking at the positioning of some department stores — Saks Fifth Avenue on the high end, Walmart on the low end and a Macy’s or JC Penny somewhere in the middle. Each one of these stores is positioned differently. Each creates a different mental image in your mind when you read the name. Make no mistake, this is done on purpose. Consequently, everything the store does must be consistent with their positioning. The logo, the pricing, the personnel, the advertising, etc. All must be consistent with their position in the marketplace. Even the smell inside the store (believe it or not, some high-end stores will actually infuse their ventilation systems with different fragrances and perfumes) should be consistent with their positioning. For law firms, they too should develop a positioning plan. Determine how you would like to position your law firm (high end, middle of the road or discount) and then make sure everything you do… every marketing initiative… every marketing piece you produce is consistent with that positioning. For example, if you had a “high end” law firm positioning, you would never use photocopy paper for your letterhead, nor would you answer your own phone, right? There is a certain positioning expectation that people have once you present yourself a certain way. The reason this is bad marketing strategy is because if you present yourself to the public as someone who handles all types of law, i.e., a general practitioner, you will find it EXTREMELY difficult to develop a reputation in any area of law because people won’t really know exactly what you do. Instead, look for a niche in which you can concentrate your marketing efforts. I’m not saying you have to necessarily drop everything else; what I am saying is, at the very least, you should have a medium or long term goal of developing a niche you can grow and upon which to build a reputation. It can be a standard “one-level” niche like criminal defense, bankruptcy or family law… or it can be a two-level niche like family law for men (or women), motorcycle injury law or restaurant law. There are so many ways you can identify, select and exploit a niche, I’m limited by space here. But I will revisit this topic soon. 4. What is your Unique Selling Proposition (USP)? Once you identify #’s 1-3, you need to answer #4: What statement can you make about your law firm that makes you UNIQUE? 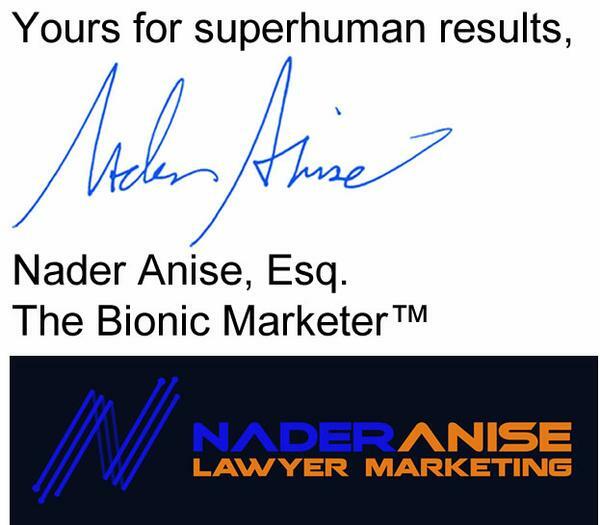 Nowadays, with increased competition, this exercise is one of the most important things you will ever do to market your law firm. Although this is an old example, it’s still one of the best of a USP. Years ago, when Domino’s was starting out and trying to gain market share, they came up with this as their USP: “Hot, fresh pizza in 30 minutes or less, delivered to your door, guaranteed… or your money back.” At the time, no local mom and pop pizzeria had ever made such a claim — nor would they dare! Domino’s had given an absolutely irresistible reason for people to order from them. Plus, it immediately identified why they were different from everyone else. It was this one statement that turned them into the household name they are today (it certainly wasn’t on account of their great pizza!). For law firms, a USP is absolutely crucial because competition is fierce. Potential clients are always wondering why they should hire one lawyer over another. You MUST give them a clear, believable and IRRESISTIBLE reason to select you. Without it, you will have an extremely difficult time competing at a high level. I know I’ve given you a lot to chew on here. Think it over and let me know if you have any questions. But, whatever you do, make sure you are able to answer these questions before you proceed with any marketing.